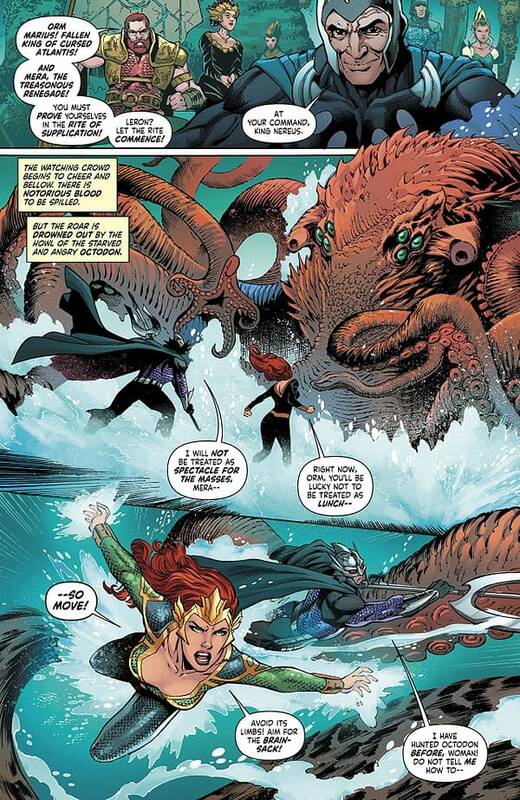 Mera and Ocean Master are put into trial by combat against a massive creature called and octodon before they can speak to Nereus, the King of Xebel. If they survive, they will still have to convince Nereus and Xebel to aid them in their fight to dethrone Corum Rath in Atlantis. Back on land, Tula and Erin discuss the odds that Orm Marius will fulfill his promise to return to dry land to be a family with Erin and Tommy instead of getting involved with the politics of Atlantis one more after the ousting of Rath. Mera: Queen of Atlantis #4 cover by Nicola Scott and Romulo Fajardo Jr.
Mera: Queen of Atlantis #4 is another painfully chatty issue in this miniseries. 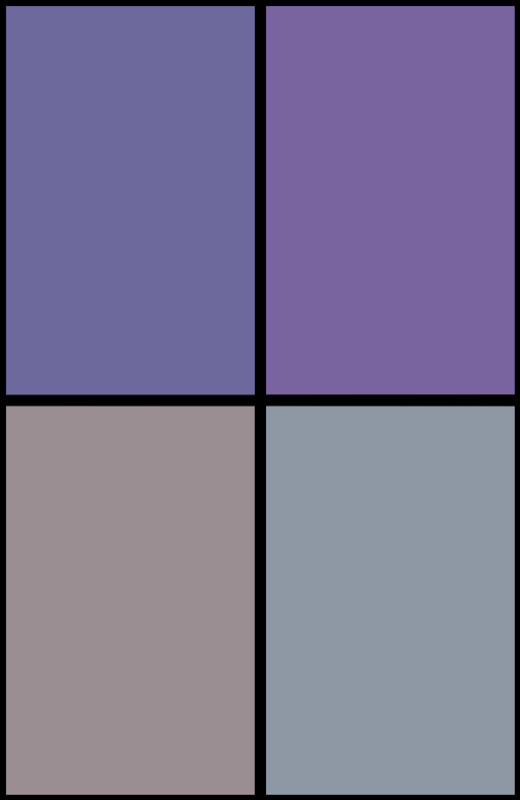 While there is nothing inherently wrong with this comic opting to spend much of the runtime spouting dialogue, it is hampered by the fact that the plot points are predictable, and that said dialogue is boring. There are some interesting ideas in this book. Namely, the positioning of Xebel as a masculine and warlike culture as an obstacle for Mera and something attractive to Ocean Master. However, even this is arguable undone by the final twist at the end. That contrast of masculine war and feminine peacemaking could arguably justify the abundance of dialogue in this book, but it’s undone by how uninteresting the dialogue is. Plus, the scenes with Tula and Erin are especially dull and seem to only serve to reiterate what we are already seeing: Ocean Master is changing as a person. Those scenes with Erin and Tula arguably go somewhere in the end, but it’s out of left field and could have been just as well shown without the constant cutting back to scenes with these two characters chatting about Orm. Lan Medina’s artwork is still quite good, even if it does have the occasional glaring and off-putting focus upon T&A. The suits of Mera and Ocean Master look quite good, the octodon has a solid visual design, and characters are made to be quite expressive. Norm Rapmund’s ink work is good too, and Veronica Gandini’s colors are vibrant and appealing to the eye. Mera: Queen of Atlantis #4 is another disappointingly slow and flawed installment for what could have been a great miniseries. 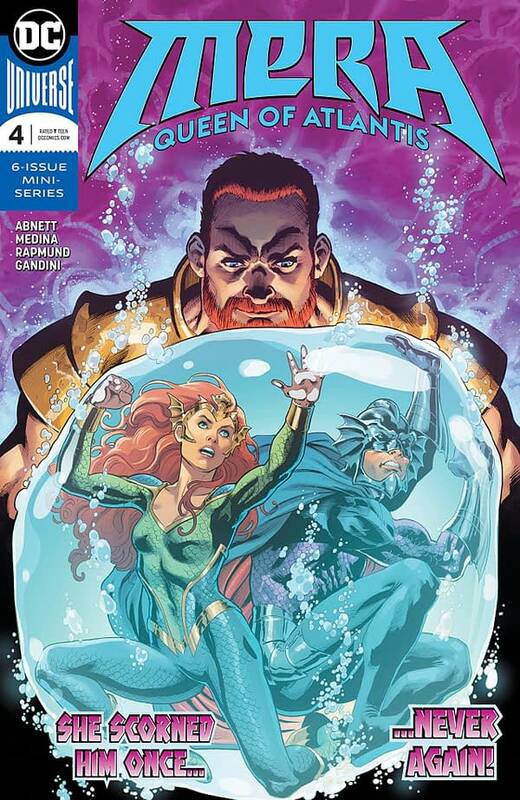 The characters and talent are readily available for a special companion comic to Aquaman, but the story is too slow and themes too confused. The art has been solid throughout, but the narrative has been lacking. Unfortunately, I can’t recommend this one. Give it a pass.